In the field of design and publishing, Cenon has been improved massivly to even satisfy high demands. Images can be read in the formats JPG, GIF, TIFF etc. For image procession, Cenon offers a simple and suitable function to expose images. Memory hungry images can be replaced with thumbnail images during work. This makes working a breeze even with fat images. Text, Lines, Poly-Lines, Arcs, Rectangle, Vezier Curves and complex paths are the basic elements for graphical work. All graphic objects can be created and handled fast and intuitively. A clean layer management, grouping function, and Undo/Redo allows for fluent working in a professional environment. The graphic elements can be rotated, scaled and aligned. 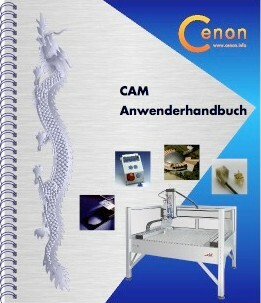 Cenon also offers some special functions to punch, build contours etc. 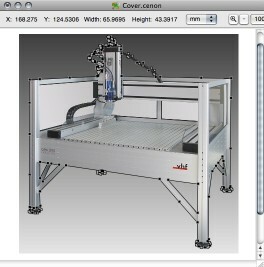 What was created for the output on CNC machines serves very well in design and publishing applications, too. There are three different kinds of color shading implemented in Cenon. Linear in all direction, concentric and axial. The last one is a cute way to make pretty pie charts.